During the time spent idling on the North Channel Bridge, waiting to get through the Canadian border crossing at Cornwall, some drivers probably wondered why the bridge is so high. After all, ships don’t use the canal or the channel of the St. Lawrence River which Cornwall fronts. In fact, the high-level bridge was designed to accommodate large vessels in an all-Canadian St. Lawrence Seaway, which never materialized. This is pertinent because the high-level bridge, with its extensive spans and approaches, is in the process of being replaced by a new, much shorter, low-level crossing (see images below). The federal government is picking up the approximately $75 million dollar tab, which includes demolition of the old bridge and street realignments. The whole project is expected to be completed by 2016, though the new bridge will be opened to traffic before then. 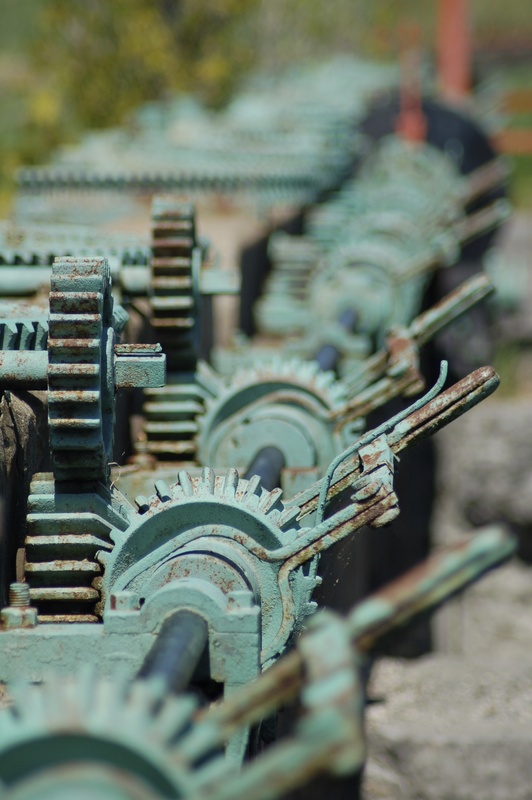 This post will highlight some historical aspects of the soon-to-be replaced bridge, drawing from my forthcoming book on the creation of the St. Lawrence Seaway and Power Project. Seaway channel running under to the power dam in the middle distance. Note the elevated span of the bridge to provide full clearance for vessels. to accommodate the new bridge). At Cornwall the bilateral Moses-Saunders power dam, with the Canadian and American generating stations seamlessly meeting in the middle, created Lake St. Lawrence in conjunction with the Long Sault dam just a few miles to the west and the Iroquois dam much further upstream. To the south of the Moses-Saunders dam (now renamed the Roosevelt-Saunders dam), the 10-mile long Wiley-Dondero ship canal, entirely in American territory, houses the Snell and Eisenhower locks. 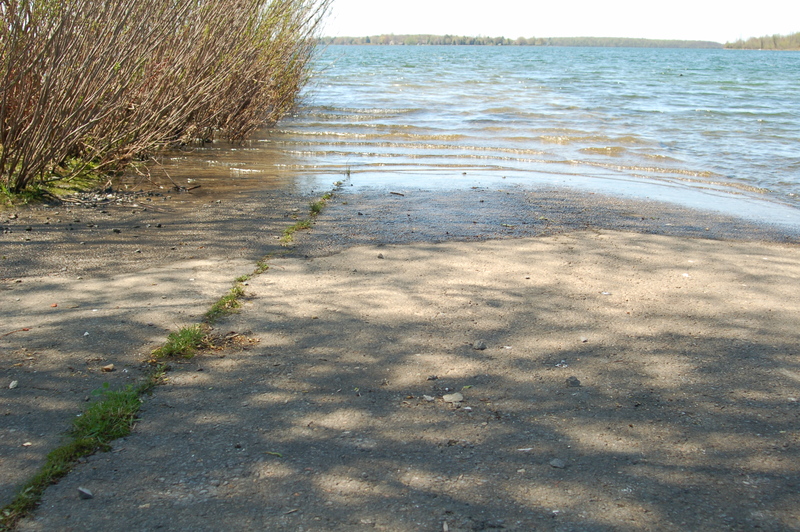 The area to the west of Cornwall – including the Lost Villages – was inundated by Lake St. Lawrence, the headpond for the power dam. Since just shy of 40,000 acres would end up underneath the water, governments and agencies on both sides of the Canada-U.S. border had to acquire huge amounts of property. Land acquisition in Cornwall, which was downstream of the power dam and thus not flooded, was mainly connected to transportation infrastructure such as bridge and canals. For example, in 1955 the federal government took 52 acres and approximately 100 properties. In 1957, Canada and the U.S. bought the Cornwall International Bridge Company and replaced the dilapidated existing span with what became the Seaway International Bridge. 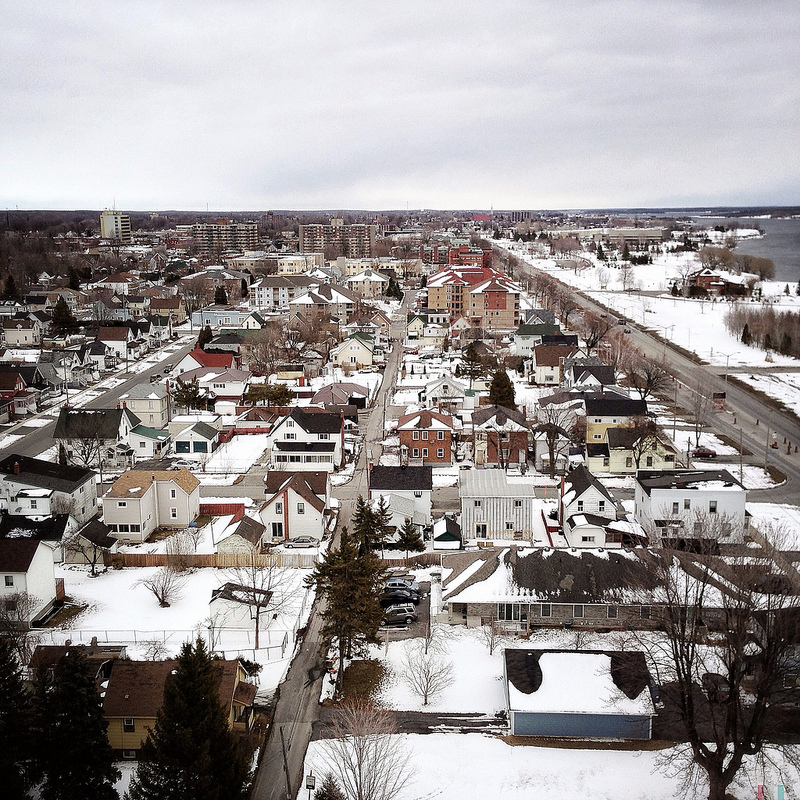 This also necessitated acquiring – a rather generous term for the methods used – land from the St. Regis First Nation. Taking a step backwards in terms of chronology, in the early 1950s the Louis St. Laurent government had attempted to secure an all-Canadian Seaway. This would have put all Seaway locks on the north (Canadian) side of the river, including locks at Cornwall. But the all-Canadian Seaway plan was thwarted by the Americans, and the St. Lawrence project ended up as a joint endeavour. Under a 1954 agreement, the locks passing the Moses-Saunders dam were put on the American side. But Canada fought hard to reserve the right to build a future all-Canadian Seaway that would involve locks at Cornwall running north of the power dam. 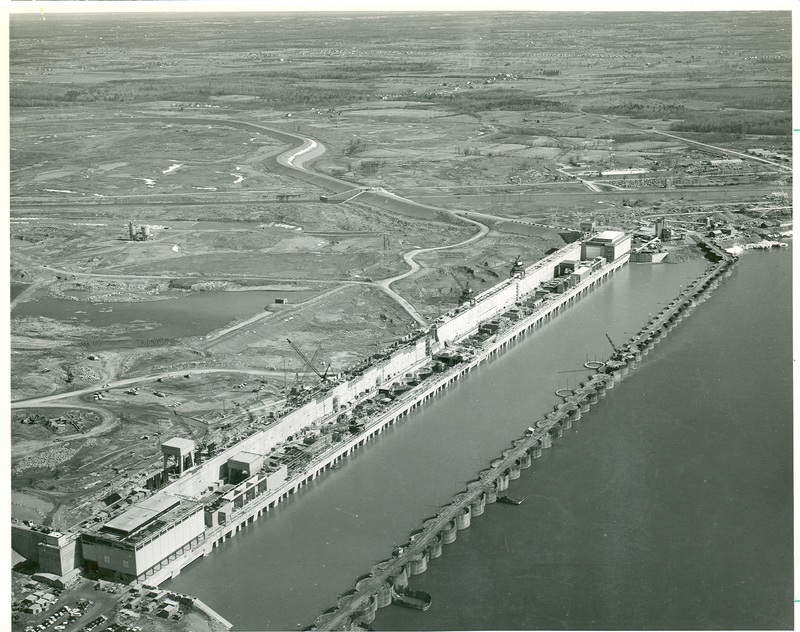 Despite American objections, Canada took several steps during Seaway construction, including a breach in the dike beside the power dam, that could serve as the basis for a future Canadian lock. The channel and the breach in the dike are still readily apparent today. 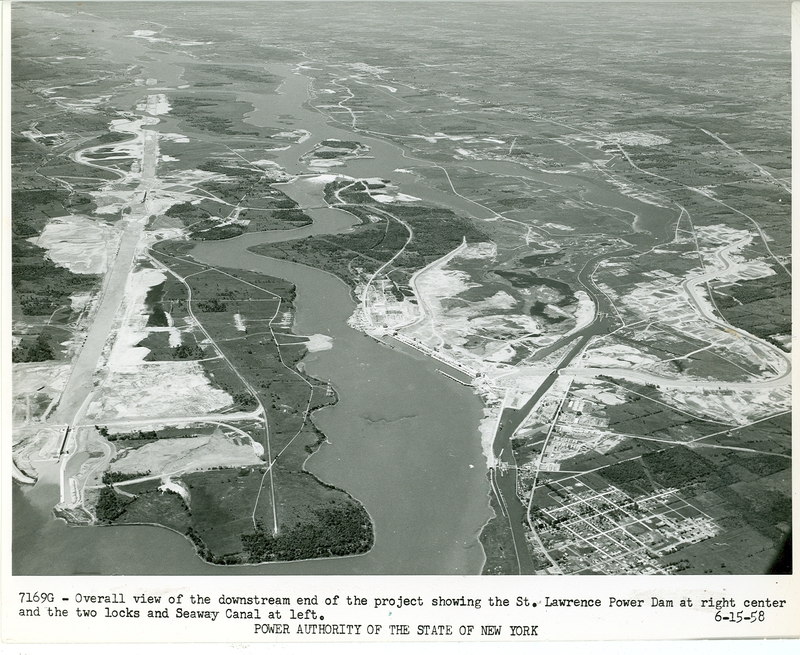 View (from south) of Moses-Saunders Power Dam under construction. lock in dike in upper center of photo). Photo courtesy of Ontario Power Generation. The new North Channel bridge would have to cross over the prospective all-Canadian route, and thus Canada built the bridge to a height sufficient to accommodate deep-draught vessels. However, this did not prove necessary, as the all-Canadian Seaway was never built, in large part because the Seaway failed to live up to traffic and toll expectations and thus it didn’t make financial sense to build a competing set of locks on the Canadian side. It may take area residents by surprise to learn that the original plans for the South Channel Bridge, connecting Cornwall Island to the U.S, were quite different from the final placement. Canada and the U.S. were legally obligated to replace the bridge for the New York Central Railroad that was displaced by the Seaway, and it would have to be at a low grade to permit rail traffic. Initial American plans called for a bridge across Polly’s Gut, a narrow and turbulent stretch of the St. Lawrence River between Cornwall Island and the American mainland to the west (rather than the south where the bridge was eventually built). This involved a traffic and rail tunnel that would pass under the Snell lock (because of unstable subsurface conditions, a traffic tunnel was later placed under the Eisenhower lock a bit further to the west). The route was also designed to maximize traffic exposure to the grand new park system that Power Authority of the State of New York (PASNY) Chairman Robert Moses – most famous for his remaking of New York City – had planned for Barnhart Island. That route was a problem, however, as it would mean a much longer trip for the St. Regis (Akwesasne) First Nations. This group had just over 2,000 members, divided between Cornwall-St. Regis-Chenail, an area spreading over Ontario, Quebec, and New York. The Canadian members of this group would have to travel up to 25 miles in a round-about fashion through U.S. territory to access social and industrial services they required at Cornwall. This would negatively affect the community life of the area, as many members attended schools, picked up family allowance and pension cheques, and purchased groceries and supplies in Cornwall. The Canadian federal government was opposed to the Polly’s Gut crossing plan because of the impact on St. Regis, though Ottawa was most concerned about the increased cost of relocating facilities to St. Regis or of transporting them to Cornwall by bus or ferry. But the New York Central Railroad was convinced to abandon its line from New York to Ottawa in 1956. 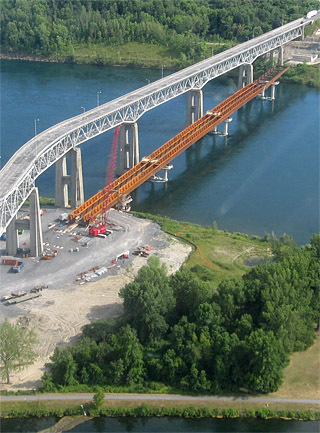 Without railway grade to worry about, a high-level traffic bridge could be built directly from Cornwall Island to the U.S. mainland just east of Massena instead of over Polly’s Gut. This would be cheaper than the Polly’s Gut alternative, and cut the travel distance for the St. Regis band members by more than half. But it did lead to cost overruns for PASNY because of the planning and preparation that had already gone into the initial Polly’s Gut bridge scheme. And it infuriated Moses, who launched into his trademark tirades and scathing letters. (along  the left side). Note the western end of Cornwall in the bottom right corner. Much of the area upstream of the dam would eventually be inundated. 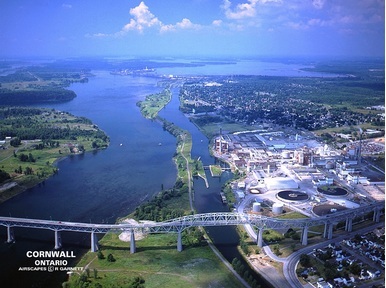 Industrialization of the St. Lawrence in the 1950s transformed the landscape/waterscape, transportation infrastructure, and the urban-river relationships at Cornwall. The city’s traffic patterns were spatially reorganized. The No. 2 Highway, which had been the main auto route between Montreal and Toronto, needed to be relocated since it would be mostly under water. The No. 2 was rebuilt near the shoreline as a local highway, while a freeway (Highway 401) was eventually built north of the community. Brookdale Avenue became the central axis and connection from the bridge to the new freeway, shifting the commercial center of Cornwall away from downtown. 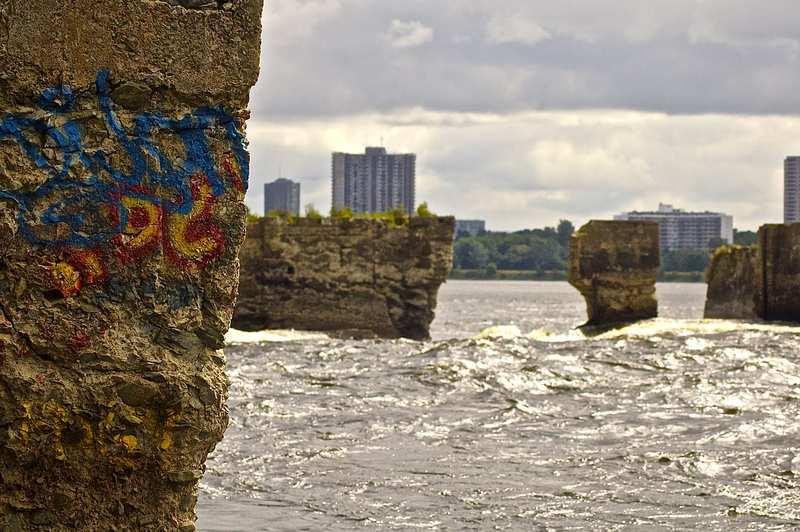 The old canal along the city’s waterfront, and much of the related industry, was abandoned. In many ways, the community was cut off – physically and symbolically – from the river. Yet it is too simplistic too portray the St. Lawrence as merely a defeated river; rather, it is an adapted envirotechnical system characterized by different relationships between environment and technology, artificial and natural, and city and river. Nonetheless, the environmental repercussions for the St. Lawrence were enormous, both in the short and long run. 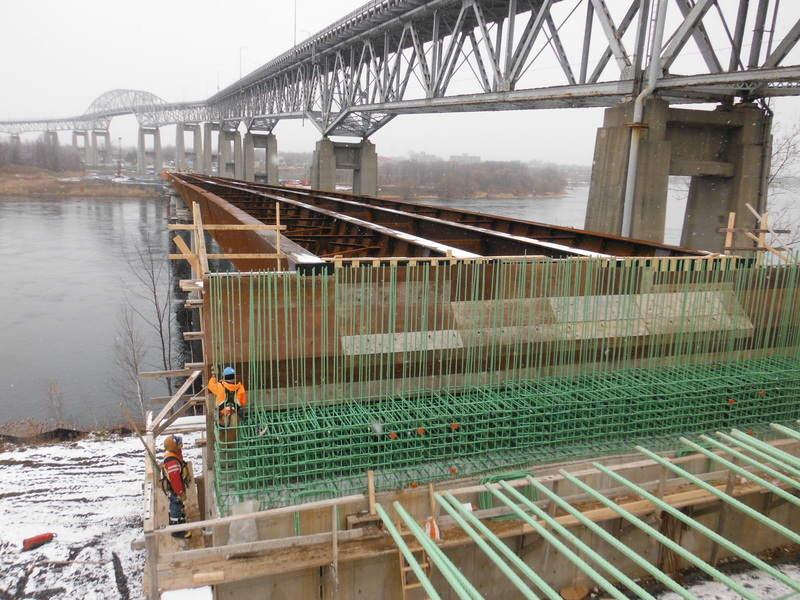 Just as the Seaway International Bridge changed the area, the soon-to-be-completed bridge could well forge new patterns and relationships. 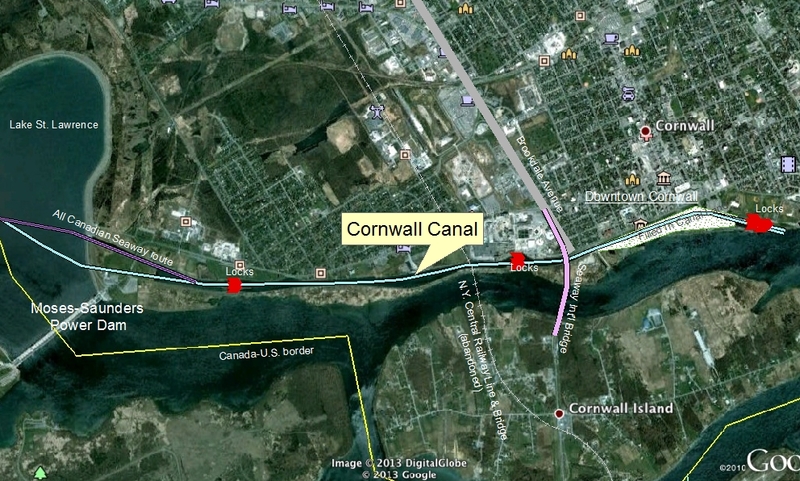 The low-level bridge will have a range of ripple effects on transportation routes in and around Cornwall. For example, vehicles will leave the bridge much closer to the waterfront and downtown business and tourist area. Resituating the bridge will hopefully help improve the awkwardly-placed border station. Granted, waiting on the bridge to clear customs provided a bird’s eye view of Cornwall to the east (see picture above), and brownfields from industrial abandonment to the west – though I’m told that would have been a much less pleasant experience back when the mills spewed noxious pollutants out of their smokestacks at virtually the same level as the waiting vehicles. The toxins fumes likely shortened the lifespan of the bridge, as well as local residents, and contributed to its aesthetic deterioration. The dramatic appeal and elevated view of the North Channel Bridge will be lost, but the designs for the new bridge look promising. At the very least, it will be less imposing on the skyline, will have a much smaller footprint, and be less of a physical divider. The construction of the new bridge and the removal of the old span will hopefully reinvigorate recreational and cultural uses of the waterfront area. Foot and bike movement across the river will be improved – crossing wasn’t always a pleasant experience on the elevated North Channel Bridge, to which anyone who has walked across its precarious sidewalk on a cold or windy day can attest!